My kids started their mid-test for the first semester yesterday. I didn't prepare any lunch bento for them as the school will dismiss at 12PM during the mid-test week. So the kids will have their lunch at home. This morning I only prepared snack bento for the 15 minutes break between the 2 tests. School will also provide snacks for the students but my daughter asked me yesterday to bring her own snack to school. My son didn't want to bring snack bento. He said that today's school snack was pizza and he wanted that :p As much as I love to make bento, I never pushed my kids to bring bento if they don't want to. School catering also provides very healthy and balanced foods. And lately I let my son to have the school catering because they provide a lot of Indonesian foods that I don't normally cook at home so often. So I think it will be a good experience for my son to explore the taste from different kinds of foods. Inside the box : Pandan sandwich bread & regular white sandwich bread with pandan kaya jam, nectarine, orange, and mango. Good luck for your kids' test, Lia...and it is a cute black kitty! All the best to Audrey and Andrew in their tests! Did you baked the pandan bread yourself?? The color is so bright and it looked so soft! Perfect Chococat! And I loved the green bread.. ^_^. @gnoegnoe : Thanks a lot Gnoe! @Rio : hehehe ... Thanks a lot Rio! So cute!! What did you use for the whites of eyes and ears? Also, why is your bread green? lol. Ah.. I agree with you with not pressuring kids to eat what we make. I love how easy going you are. Your kids are soooo lucky to have a mom like you! Also, again, I just love your photography..
love this big-eyed kitty and the pretty contrasting bread colors, plus juicy fruit snacks. should be a great treat for audrey on her break. wishing A and A great luck on their test! @OhayoBento : Thanks a lot for your nice words Heather! @Susan Yuen : Aww ... Thank you very much Susan! All the best to Audrey and Andrew! 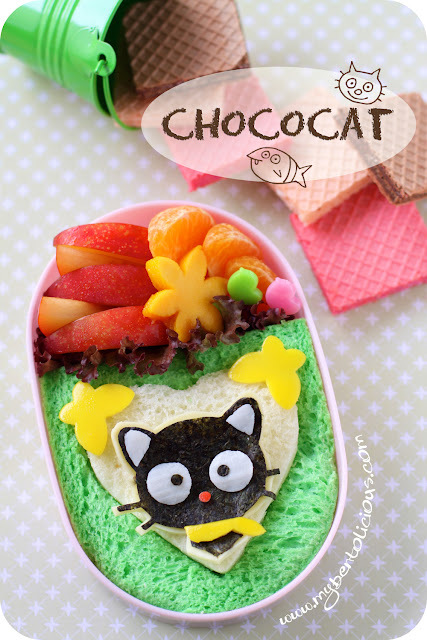 The Chococat is so cute! Hope your kids did well on their tests! I love your bentos but I am always amazed at your awesome photography!!! I love Chococat! I made sanrio cookies some time ago, including chococat as a model :). Good luck to your kids' tests! Cooking Gallery : Thanks a lot for your sweet comment! Sooooo cute!!! I love it!